In 2012, vehicle fuel-efficiency standards were announced that require all US cars and light trucks to reach 54.5 miles per gallon on average by model year 2025. As a result, automobile manufacturers are working to improve fuel efficiency in order to meet current and future fuel economy requirements plus emissions regulations. Vehicle fuel efficiency is logically related to the efficiency of the internal combustion engine. It has been estimated that the thermal efficiency of a modern internal combustion (IC) engine is limited to 20-40%, while approximately 60-70% of fuel energy is wasted in the form of heat. Figure 1: Schematic of a general Rankine Cycle (RC) system layout including four main components: evaporator, expander, condenser and pump . Several technologies have been investigated for waste heat recovery including thermoelectric generators (TEG), turbochargers, sixstroke cycle internal combustion engines, and the Rankine Cycle (RC), etc. The RC system has been identified as a promising solution to harvesting part of this waste energy from vehicles as regenerated mechanical or electrical power . 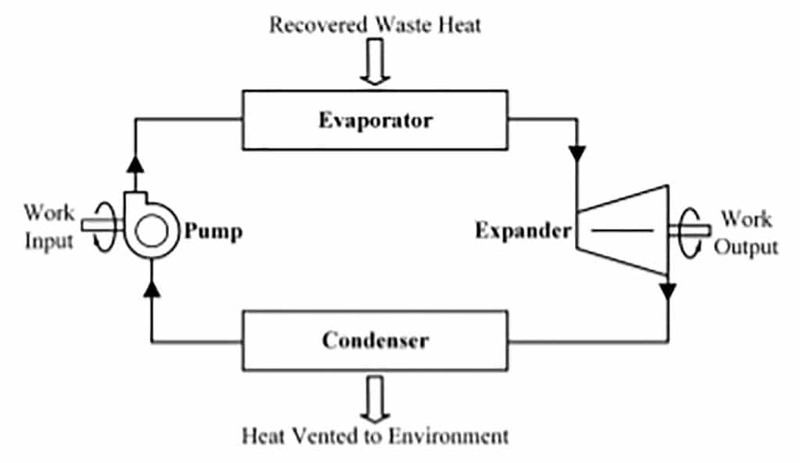 A RC system includes four main components: 1) an evaporator, 2) an expander, 3) a condenser, and 4) a pump; refer to the flow loop of a typical RC system in Figure 1. The pump drives the working fluid to circulate through the loop, and the evaporator utilizes a waste heat source to vaporize the working fluid. The fluid vapor expands in the expander and converts thermal energy into mechanical power output. Then, the expanded vapor flows through a condenser to turn back into liquid phase, thus completing the cycle. The application of RC to passenger vehicles is very challenging due to space limitations. In this article, a new concept and case study into the future application of Rankine Cycle to vehicle waste heat recovery combined with next generation power electronics (PE) cooling is provided. For automotive applications, the RC system is usually installed downstream of the catalyst to avoid negative influence on emission control by extending the time for the catalyst to reach light-off temperature at cold start and to utilize the extra energy produced by pollutant conversion within the catalyst. 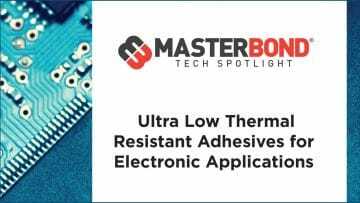 Heat sources on vehicles are different from other typical industrial heat sources, which are stable and have fewer space limitations for system implementation. 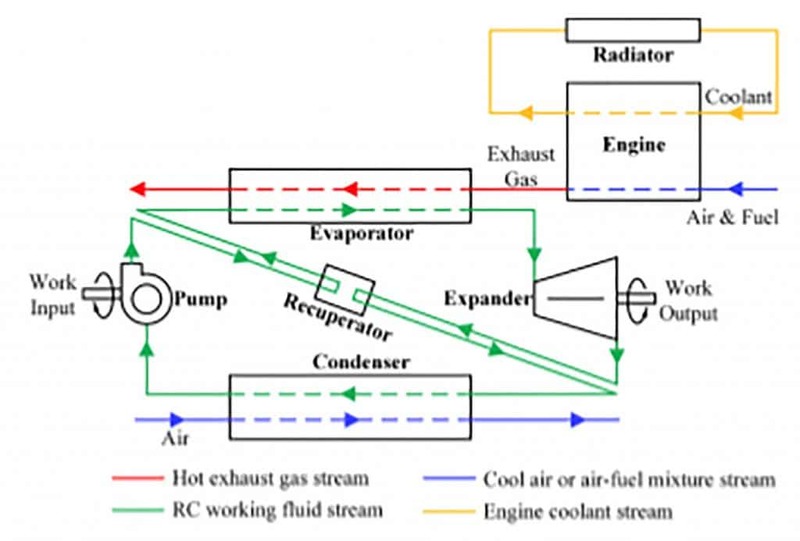 The most common and simple RC system structure is shown in Figure 2, which utilizes the exhaust gas as the heat source to evaporate the working fluid. Figure 2: Structure of a typical RC system for automotive application . The pump drives the working fluid to circulate through the loop, and the evaporator utilizes the waste heat source to vaporize the working fluid. The fluid vapor expands in the expander and converts thermal energy into mechanical power output. Then, the expanded vapor flows through a condenser to turn back into liquid phase, thus completing the cycle. A recuperator could be added before the evaporator using the steam from the expander to preheat the working fluid. The working fluid of the RC cycle could be wet fluid, e.g. water and ammonia, dry fluid, e.g. R113, R245fa, etc. or isentropic fluid, e.g. R11, R134a, etc. The reader is referred to Zhou et. al  for details about different RC structures for automotive application and the criteria for working fluid selection. Given the structure of a typical RC system, a question then arises regarding what is the best platform, e.g. vehicle type, for RC application. This is linked to another question of how to utilize the RC expander power output. Generally, there are two ways to use this recovered energy: 1) outputting the mechanical energy directly to the crank shaft or 2) combining the RC system with electrical generators to convert the mechanical energy into electricity. In the former method, a speed reduction gearbox might be required if the expander has a speed mismatch with the engine. For long-haul diesel trucks, there is more room in the engine compartment and the exhaust gas condition is more stable making these vehicles good candidates for the first RC power utilization method. For small passenger vehicles, the driving profile is not as stable leading to a fluctuating exhaust gas temperature. In this case, the second energy recovery method seems to be a more reasonable option, which requires an energy storage system to store the generated electricity. A hybrid vehicle (HV), which recovers some braking energy to increase the overall fuel efficiency, provides an ideal platform for transforming thermal energy to electricity, storing the electricity in batteries, and feeding this electricity back to the vehicle. By integrating a RC system into a HV to recover a portion of the waste energy, a hybrid vehicle will break the energy efficiency limit of the internal combustion engine to further boost fuel economy. Another advantage of applying a RC system to a HV is the relatively constant load conditions for the engine in a HV. Regarding the integration of a RC system to a HV, the approach taken in minimizing the system complexity, weight, cost, and negative effects on existing components is balanced with maximizing the RC power output. Currently, as an add-on system to an existing vehicle, RC system integration might lead to important interactions and consequences, such as increased vehicle weight, increased engine back pressure, increased cooling demand of the vehicles, etc. Therefore, minimizing the interactions with existing vehicle components, and minimizing added RC components, is a main target for RC automotive application. Then, we must determine the best way to integrate the RC system into a HV for waste energy harvesting. Before answering this question, let’s switch gears to another topic: two-phase liquid cooling for power electronics. A transition away from silicon toward wide band-gap (WBG) semiconductor materials for power devices is expected in the next decade. For future electrified vehicles, the use of WBG devices, e.g. silicon carbide (SiC), gallium nitride (GaN), or diamond, in power electronics enables higher operational frequencies, lower switching losses, and high temperature, >200 °C, operation. However, the increasing demand of higher performance combined with smaller PE module size results in a continuously growing heat dissipation requirement, which challenges the limit of single-phase liquid cooling and makes two-phase (2j) liquid cooling [3, 4] attractive due to enhanced thermal performance. Figure 3: (a) Representative single-phase liquid cooled PCU; adapted with permission from ; (b) Structure of 2j power electronics cooling loop with three main components: a PE cold plate, a radiator and a pump . A 2j cooling loop has three main components: 1) a two-phase cold plate, 2) a radiator/condenser, and 3) a pump; refer to Figure 3 (a) for a representative single-phase liquid cooled power control unit (PCU) and (b) for the structure of a 2j power electronics cooling loop. A refrigerant, such as R245fa, HFE7100, or HFC 134a is typically used as the working fluid in a 2j power electronics cooling loop. Different fluids may be selected depending on the type of power device utilized and its maximum operational temperature. In the current study, R245fa was selected as the working fluid for demonstration purpose. Comparing the RC structure shown in Figure 1 and the 2j cooling loop in Figure 3 (b), it is evident that both of the systems have a pump, a heat exchanger to dissipate the heat from coolant to environment, and a heat exchanger to absorb heat from the heat source. Furthermore, the same working fluid, e.g. R245fa, may be used for the two different systems. Therefore, if a RC system is integrated with a 2j cooling loop, not only more waste heat may be utilized to generate power, but under-hood space may be conserved since only an extra evaporator and expander are required. Figure 4 shows the concept of combining the RC system with the PE 2j cooling loop. Here, the pump, cold plate and HV radiator are three main components for the 2j cooling loop. To realize waste heat recovery, an evaporator and an expander are added to the system. A recuperator is also included in the current system, which is not necessary depending on the available space and capacity of the HV radiator. The waste heat from the engine coolant is not utilized in this system, but a liquid-to-liquid heat exchanger may be added to recover part of the coolant heat, considering the low boiling point of the refrigerant. A thermodynamic model of the RC-2j system is developed on a commercial numerical modeling platform  to analyze the impact of the PE cold plate to the whole energy recovery system; a detailed sketch of the model is available in . The model has six sub-models: 1) pump, 2) power electronics, 3) evaporator, 4) expander, 5) HV radiator, and 6) recuperator. The system working fluid and working conditions including assumed component efficiencies are summarized in . The overall system coefficient of performance (COP) is evaluated as COP = Wexpander/Wpump, in which Wexpander is the work output of the expander and Wpump is the work consumed by the pump system. 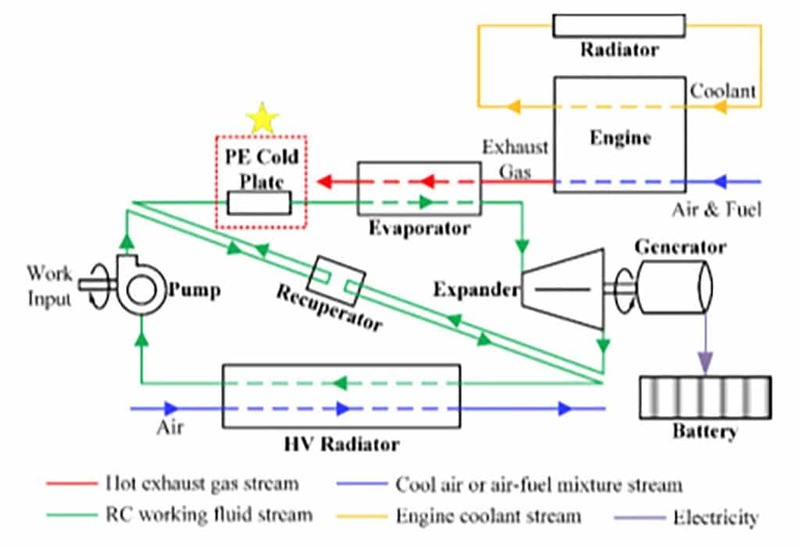 Figure 4: Integrated RC-2j cooling and waste heat recovery system for HV application which has dual functions of PE cooling and waste energy harvesting . 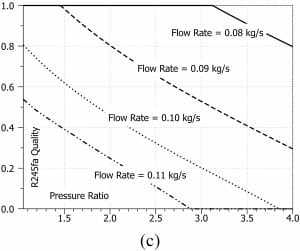 Figure 5 shows the expander power output, COP and evaporator inlet vapor quality as a function of expander pressure ratio for the RC system with recuperator (structure shown in Figure 2) at different R245fa mass flow rates, 0.05, 0.06, 0.07 and 0.08 kg/s. 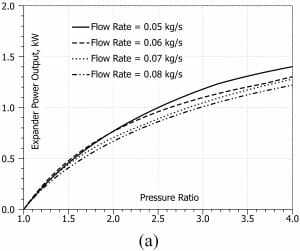 Observe that as the pressure ratio increases the expander can generate more power, however the system COP increases first and then decreases gradually. As for the R245fa vapor quality at the evaporator inlet, it decreases as the pressure ratio increases. High expander pressure ratio leads to higher system pressure within the intercooler and evaporator which can suppress boiling. For different R245fa mass flow rates, the expander power output varies between 1.2 kW and 1.5 kW and decreases as the mass flow rate increases. The COP also decreases as the mass flow rate increases due to higher power consumption by the pump. The vapor quality decreases as the refrigerant mass flow rate increases. The results for the proposed RC-2j integrated system with recuperator are shown in Figure 6. For the current system with two-phase power electronics cooling, the vapor quality at the cold plate outlet (i.e. evaporator inlet) is an important parameter that requires dedicated control. If the flow rate is excessively low, all of the refrigerant flowing through the cold plate vaporizes, which might result in dryout of the heat exchange surface within the cold plate. The flow rate also cannot be excessively high otherwise the flow through the cold plate becomes single-phase, which lowers cooling performance. The power electronics is an additional heat source in the cycle, so higher refrigerant flow rates are necessary to avoid dryout. 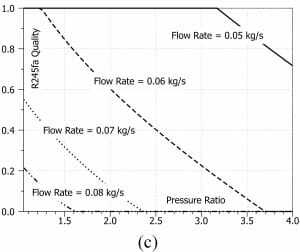 Therefore, for the current system structure, the studied flow rates include 0.08, 0.09, 0.10 and 0.11 kg/s. The variation of the expander power output, COP and cold plate outlet vapor quality follow the same trends shown in Figure 5. However, at the same flow rate (e.g. 0.08 kg/s), the power electronics module boosts the expander power output ~58% to 1.9 kW from 1.2 kW for the system without power electronics. The COP also increases ~20% from 20 to 24 since additional heat is recovered by the system. The impact of heat input from the power electronics to the waste heat recovery system is well demonstrated. 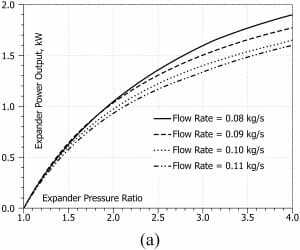 Figure 5: Expander power output, COP and evaporator inlet vapor quality as a function of expander pressure ratio for traditional RC system without PE cooling (structure as shown in Figure 2) . Figure 6: Expander power output, COP and cold plate outlet vapor quality as a function of expander pressure ratio for the proposed RC-2j integrated system with recuperator as illustrated in Figure 4 . Applying a RC system to a HV platform has great potential to further boost fuel economy to meet future emission requirements with system integration as one of the biggest hurdles. Nonetheless, a novel aspect of the RC-2j integrated system concept presented herein is that it not only keeps the HV power electronics cool at high efficiency, but also recovers more heat from the PE module for higher total system power output. It is found that the RC-2j integrated system boosted the expander power output ~58% from 1.2 kW to 1.9 kW under the same working conditions. The COP is also increased by 20% since an extra heat source is added to the system without consuming additional pumping power. Codesigning the RC system and HV power train in combination with other technologies, such as turbocharging or in-wheel motors, may drive the fuel efficiency of such vehicles to a higher level. 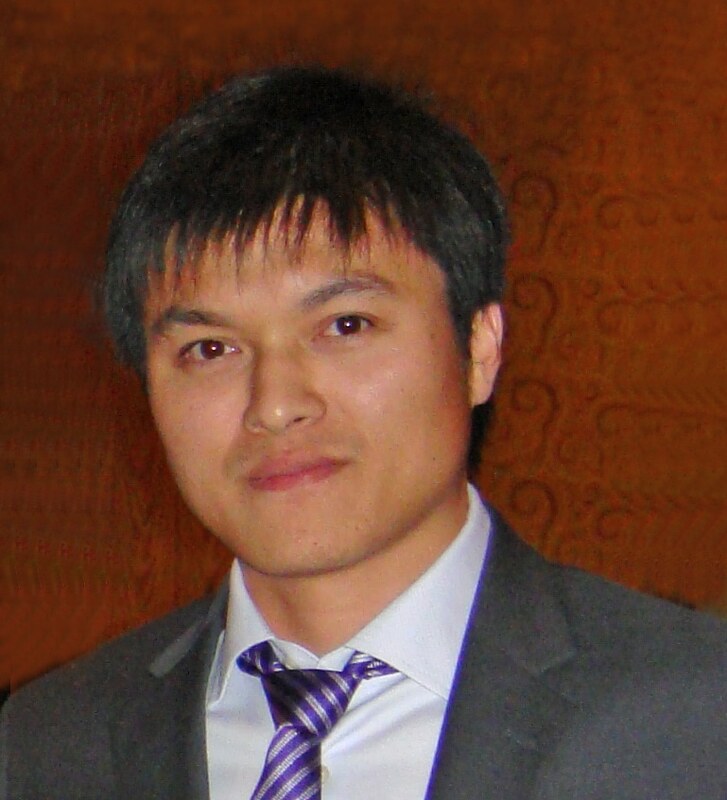 Zhou, F., Joshi, S.N., Rhote-Vaney, R., and Dede, E.M., A review and future application of Rankine Cycle to passenger vehicles for waste heat recovery. Renewable and Sustainable Energy Reviews, 2017. 75: p. 1008-1021. Saidur, R., Rezaei, M., Muzammil, W.K., Hassan, M.H., Paria, S., and Hasanuzzaman, M., Technologies to recover exhaust heat from internal combustion engines. Renewable and Sustainable Energy Reviews, 2012. 16(8): p. 5649-5659. Joshi, S.N. 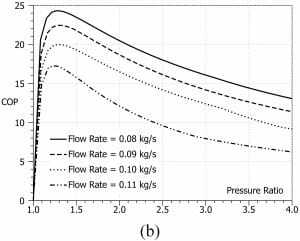 and Dede, E.M., Effect of sub-cooling on performance of a multi-jet two phase cooler with multi-scale porous surfaces. International Journal of Thermal Sciences, 2015. 87(0): p. 110-120. 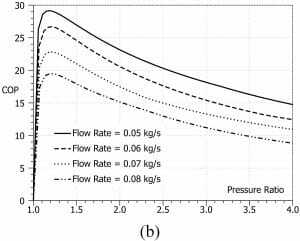 Zhou, F., Joshi, S.N., and Dede, E.M. Visualization of bubble behavior for jet impingement cooling with phase change. in Thermal and Thermomechanical Phenomena in Electronic Systems (ITherm), 2014 IEEE Intersociety Conference on. 2014. Newsroom, T.-U. 2016-2017 Toyota Prius PCU On the WWW. [Online]. Available: http://toyotanews.pressroom. toyota.com/. June 2017. Imagine.Lab, L., AMESim – Advanced Modeling Environment for Performing Simulations of Engineering Systems, http:// www.plm.automation.siemens.com/en_us/products/lms/ imagine-lab/amesim/. 2014.